An open commission where I was given a piece of tree with sentimental value to create whatever I thought was the best use for it. Starting from the lump shown below it was going to be an interesting piece whatever happened. As it was the only piece of the clients tree we had I decided to leave it thicker than usual as I didn’t want to risk it exploding on me while spinning on the lathe. In case you were wondering it’s the crown of a small willow tree. The trunk would have come out from the bottom of the photo below and the tangled mass is made up of it’s branches. Rather like an upside down root ball but without all the soil and stones to deal with! This smaller bowl below came out of the center of the bowl above. 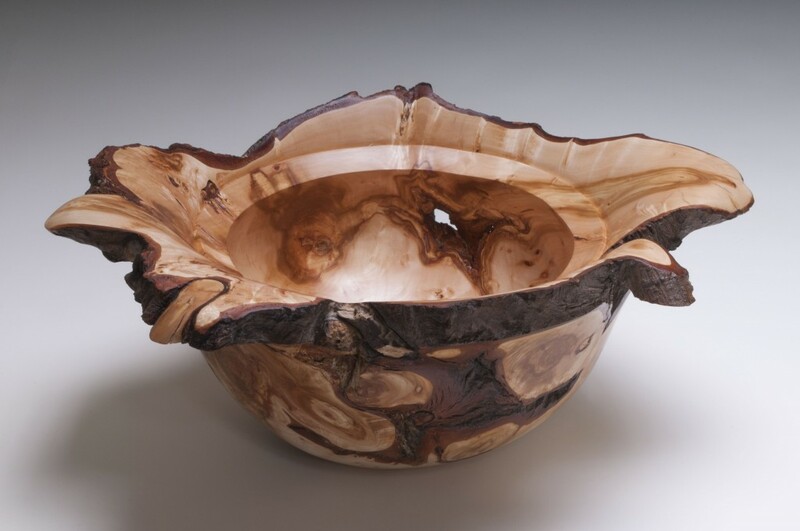 This was the first ‘proper’ bowl save that I did using the McNaughton bowl corer to take the center out in one piece rather than turning it all into shavings. The branch coming out of the rim actually goes into the bowl and would have gone through the hole in the side if it wasn’t so rotten. I decided to completely remove the foot leaving a flowing curve and supplied a ring to stand it on if it needed to be kept stable. Below is another little dead branch I managed to keep in line with the rim of the bowl. A pleasure to turn and much easier to deal with than a root ball. If anyone sees or hears of another crown like this being cut, rather than it ending up as firewood, let me know as I’d like another chance to turn something like this again.